If you are a medical provider who accepts workers’ compensation cases, you may be interested in exploring from WHERE you can be referred such cases. Depending on your state, the first idea which comes to mind is probably “Employers” or “Insurance companies, BUT did you know that there are at least 8 different entities which can send you Work Comp patients? This article will talk you through them one by one. What are the 8 Sources of new Work Comp patients? In most states, employers control the direction of care for at least the first 30 days (often longer for other states, such as Florida). This means that the patient can only see a doctor who is authorized by the employer to treat work comp patients. Depending on the employer and state, this authorization process may involve being added to a “Network” or “Panel”, or simply an informal internal list which the employer uses. For medical providers who want to increase their number of work comp referrals from employers, the first step is (often) to get added to the Network, Panel, or list which they use. In accordance with the Fordist principle of specialization, employers often ‘outsource’ their workers’ compensation administration to Insurance Companies or Third Party Administrators. The principle actors within these organizations are “Adjusters”. It varies from state to state, but adjusters may have the power to approve or deny a workers’ compensation claim. They may also be able to control direction of care. In other words, if you are a doctor who wants to increase your number of work comp cases, it helps if Workers’ Compensation adjusters trust your judgement. This will mean that they are more likely to approve not just referrals to you, but also any treatments you prescribe. Nurse Case Managers (aka ‘NCMs’) are trained nurses and usually work for a Nurse Case Management companies, or work ‘in-house’ with Third Party Administrators or Insurance Companies. They are most often utilized in more complex cases where the patient needs more support or a higher level of medical knowledge is required. There are two types of Nurse Case Manager: Field and Telephonic. As the names suggest, Field Nurse Case Managers work in the field and have direct contact with patients. Telephonic Nurse Case Managers, by contrast, handle their cases remotely over the phone. As is the case with adjusters, NCMSs may have the ability to recommend, or even choose, which doctor the patient sees. The large majority of employers, insurance companies, TPAs, and nurse case management companies select doctors from a Workers’ Compensation Network or Panel. This is, essentially a list of doctors who have been contracted at certain rates (often at a discount) and who have been deemed (by the Network or Panel selectors) as meeting the necessary criteria to accept and treat work comp patients. In most states, being on such lists does NOT guarantee work comp patients, however, NOT being on these lists can almost guarantee you receive NO work comp patients from employers, adjusters, and nurse case managers. 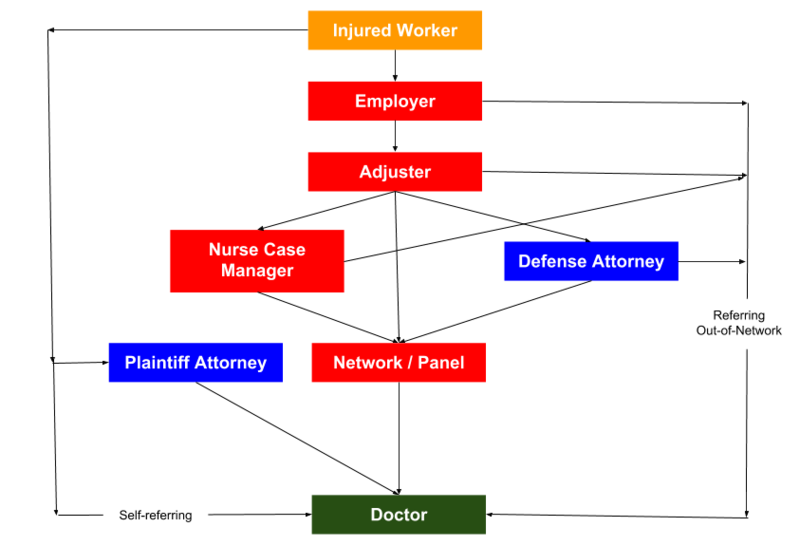 Read our previous article about Work Comp Networks and Panels. Defense attorneys, usually contracted by the employer, insurance company, or TPA, often have the ability to recommend, or even choose, which doctor the patient sees. Aside from treatment, they may also request Independent Medical Evaluations or Peer Reviews from a doctor, especially in cases where they do not agree, or are unsure of, the treating doctor’s medical opinion. Defense attorneys may pick doctors from a Network or Panel, or they may go out-of-network and select a doctor not on these lists. Plaintiff attorneys work for the injured worker and are usually hired to help secure medical benefits and/or compensation. In states where patients are able to control the direction of care, the attorney may recommend certain doctors to the patient. In states where patients can NOT choose a doctor of their choice, the attorney may pay out-of-pocket (or via an LOP) for an Independent Medical Evaluation or Peer Review which may provide a different medical opinion other than that of the treating physician (who had been selected by the employer or insurance company). Depending on the state, the injured worker him/herself may be able to choose their own doctor. In such states, it’s a good idea to try to rank high on Google for phrases like “workers compensation doctor + location” or “workers compensation + speicalty + doctor + location”. Read more about SEO for doctors. Other medical providers can also be a good source of new work comp patients. For example, if you are an orthopedic surgeon, you may be able to receive cases from urgent care centers. Likewise, urgent care centers may be able to perform pre-operative clearances for surgeons. Referrals between specialties are common and can form a regular and reliable source of new patients. Please note that this list is not an exhaustive one. Due to the complexity of the work comp system, and variation between states, there are several other possible sources of work comp referrals, such as Workers’ Compensation State Boards, IME Companies, Ancillary Networks, among others. How can doctors increase their number of work comp patient referrals? If you are a doctor who wants to increase your number of work comp patients, there are several options open to you. Of course, marketing to the list of referral sources outlined above is a good place to start. We also recommend creating a listing on Workers-Compensation-Doctors.com. Read more about Workers Compensation Marketing for Doctors.